The latest statistics for the Huntsville market are in, and they’re looking good for sellers. Welcome back to Monday Morning Coffee. Our market numbers for October are in, and I wanted you to be the first to see them. Comparing last year’s sales to this year’s, we are seeing an increase in sales and home values while seeing a decrease in the available inventory. 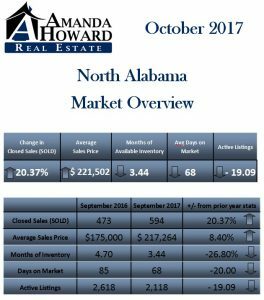 Our overall north Alabama residential sales totaled 594 homes, which represents over a 20% increase in sales compared to the same time last period in 2016. Our market is so hot right now. We also saw an increase in the average sales price by almost 8.5%, coming in at just over $217,000. 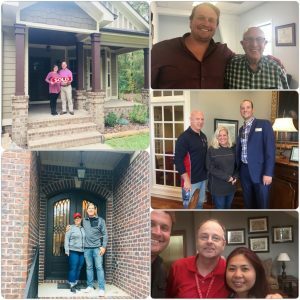 The average list price for our Huntsville-Madison County homes also increased by just over 8%, coming in at just over $221,000. Last but not least, the question everyone asks us: How long does it take to get these homes sold? The average days on market decreased by almost 20%, taking us to an average of 68 days on market. We’re looking at 3.5 months of available inventory, which verifies that we’re still in a strong seller’s market. This means that we have more buyers out there looking for available homes than we have available inventory for sale. Now continues to be a great time to get your home sold. Buyers: make sure that you’re acting fast, working with a specialist, and making your offer strong to ensure that you win the best homes out there. I’ve included a detailed breakdown for you in the market numbers below. If you or someone you know is interested in buying or selling a home, give us a call or visit us online at AmandaHoward.com.